I whirlwind in from the Southwest Ontario Slam Circuit to finish up the tour with two amazing headliners: Words and Music in Montreal and The Poet in New York at Bowery Poetry. It’s been quite a trip and it’s amazing to finish it in grand style — though a little terrifying! Both days, I land in the city, rapidly find my way around, do the gig, head to the spare room I’m staying in, and then wake up to move on to the next city. I know this is totally ordinary for most artforms, but for poetry 6 cities in 6 days feels a bit much. I’m not used to this pace, but I’m excited by it while it’s happening. Words and Music has happened at the Casa del Popolo for the last 14 years — it’s as old as the venue, as one of its flagship events, every fourth Monday. It’s primarily an anglophone night (Montreal has English and French and mixed spoken word scenes), but showcases a brilliant diversity of acts: my night, alongside me there’s Klyde Broox, a dub poetry master, Colombian-Canadian pianist Isis Giraldo, and English storyteller Gerard Harris, all hosted by event veteran Ian Ferrier. The night is dreamy and hilarious by turn, the crowd blethering away into the evening. Words and Music feels much more like the sorts of events that are more common in Scotland: showcases majoring in spoken word but that focus on diversity and bring in multiple artforms. I feel more at home here, and all the while I’m there I think how wonderful that is: that in so many cities in the world I can find a familiar sort of event where generous people gather to hear new words and sounds. Of all the cities I visited, Montreal is the one I’m saddest about not seeing more of properly. I know there’s so much more of the scene to explore there, particularly Throw Poetry at the core of the slam scene. But New York called! The Bowery Poetry Club is legendary: one of those venues that conjures ideas of magic and anarchy and something important at the heart of art. 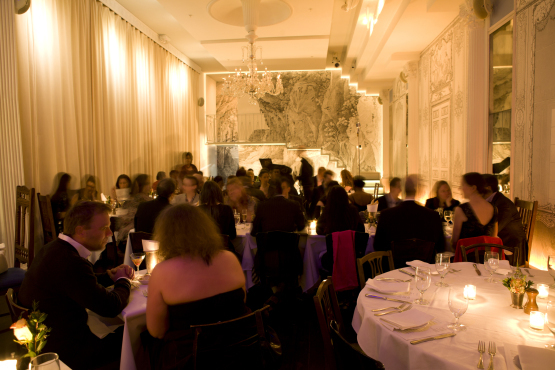 It’s been through a lot of recent changes, entering into a new venue-sharing agreement with jazz and burlesque joint Duane Park so that both well-known venues could make the rent. So where once there was the sort of dingy wild bar that’s familiar to spoken word goers, now there are decadent white drapes and chandeliers and murals. It’s beautiful — and the delighted audiences are still filling it. 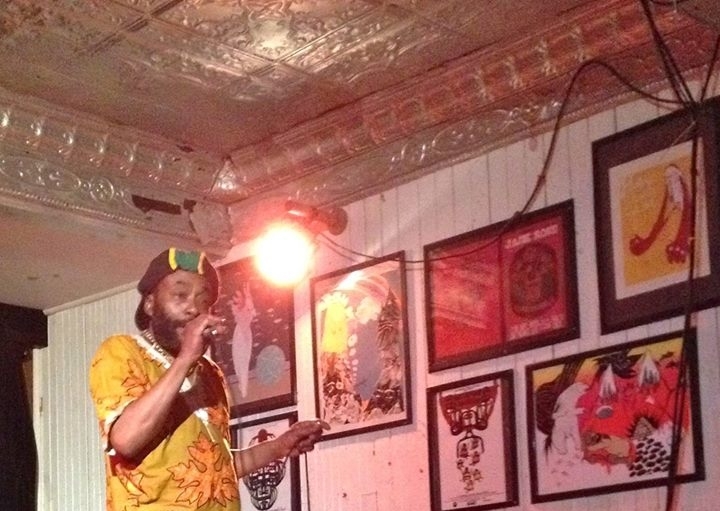 The Poet in New York is the Bowery’s flagship poetry night, a mix of open mic and music and features. It has a flow I’ve never seen anywhere before. Host Nikhil Melnechuk owns the stage, welcoming everyone and governing the flow, calling up open micers, bringing in music when we need perking up, making new and surprising things happens. I don’t know quite when I’ll be doing my set — Nikhil’s told me to be ready and it’ll depend on the flow of the night. I’m neurotic, as always, but I end up loving this: rather than plotting exactly what I’m going to do when, it means I’ve got to pay attention to where the audience is at. The audience and the poets seem to have come from all over the world. It’s a great spread of ages, origins and styles in the open mic. The music also never stays still: Shawn Randall, a Bowery fixture, is the main act on piano and vocals, bu he keeps bringing in new acts: a beatboxer, a guitarist, a country singer. In my set, we decide to experiment: for my Scots poem about beaches, Honeymoon, Shawn plays rippling arpeggios underneath and the beatboxer conjures the sea. I’ve never enjoyed reading it so much. Here and in Montreal, after the practice all over the tour, I feel like the Scots is working properly with these audiences: I’ve learned how to familiarise their ears with it, mix up high-speed impact pieces with gentler poems and their translations. I’m so grateful to these audiences for their attention and good will, and for the kind comments I’ve had on Scots: many folks surprised and delighted by it, or sharing family memories, or talking about translating between their own languages. I think it has a rich possible life beyond our own shores. It’s a grand end to tour, amongst these mirrors and drapes and poets. I couldn’t quite believe where I was, amongst so much poetry history: a place named after the artform, at the heart of a scene, where the form is celebrated and experimented with and made popular and made weird. It just came about through one speculative email, just like the tour started with a single slam, but it’s all come together. When I landed home, my phone started downloading backed up podcasts, and the first one to appear on my screen was Indiefeed Performance Poetry with Christine O’Keefe Aptowicz’s A Brief History of the Bowery Poetry Club. It was a beautiful message for me: a reminder of where I’d been, where we’re going, and what poetry is for. It was a real pleasure to share the stage with you, Harry. Looking forward to the next time we cross words.